cotton processing at Surat and leading manufacturer of polyester fabrics. Value additions on fabrics have gained enormous importance in the current fashion scenario. the latest embroidery machines such as Tajima and the Schiflies. Krishna to quote lowest and to be most competitive for processing of fabrics. As we have set high standards of commitment and trust in the business of textiles and Fabrics, we have gathered a vast clientele across India and the Globe. We are serving our customers from last 27 years with exceptional services and product quality. Our strength is the ability to take a customer's needs or product and develop a unique product or concept to fulfill their requirement. We offer customers the ability to work jointly with us towards a common goal. Krishna continues to set new diverse standards in product excellence and customer satisfaction by providing customized programming and designing. Designed as per the latest trends in fashion, the designs created by the company are well accepted and appreciated in the domestic and international market for their high quality and unique colors. We are aware of the latest fashion trends and changes in the fashion market and designing is done according to the style that is in vogue. We take great pleasure in highlighting a glittering collection of sumptuous fashion wear for ladies which are exquisitely designed and meticulously crafted to bring out the best in every woman.The company's quality assurance measures stand on the foundation of the solid belief that the quality begins & ends with the customer. “Quality in fabrics is no longer an option but a basic requirement in Today's World”. Krishna possesses a state-of-the-art dyeing and printing process unit, which is backed by hi-tech machines and latest technology. The process house at Surat is equipped with latest technology, sophisticated machineries and state of the art infrastructure. 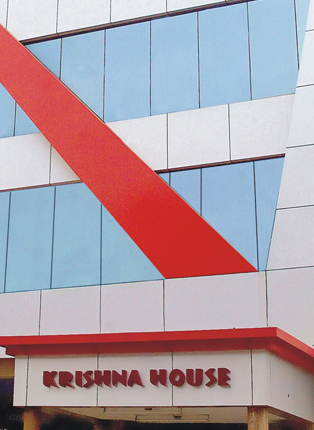 Krishna process house is strategically located in Surat also known as a textile hub of India.